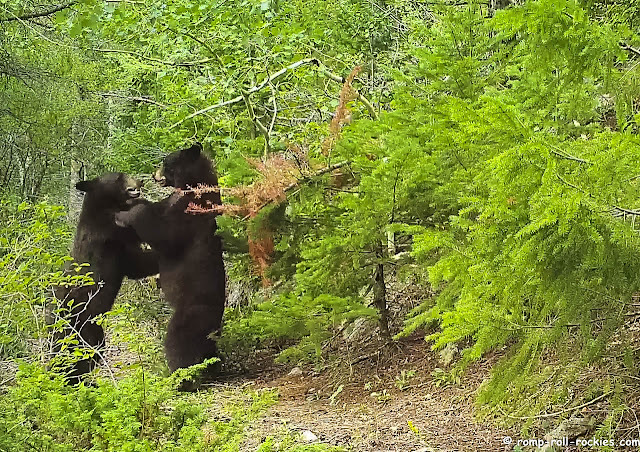 Romping and Rolling in the Rockies: Bear Buddies Playing! Today I have a surprising and fun bear story. 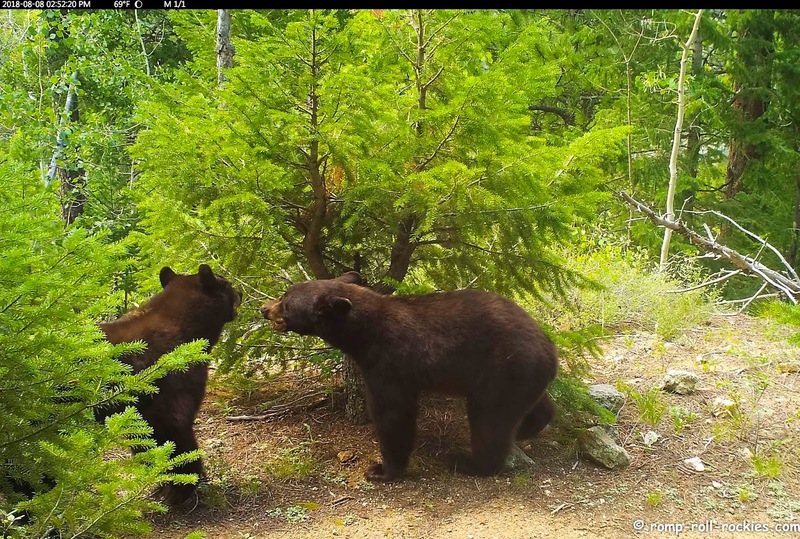 Before I knew the story, I saw this photo on the tiny LCD screen of my trail camera. My mind said "Isn't that odd? 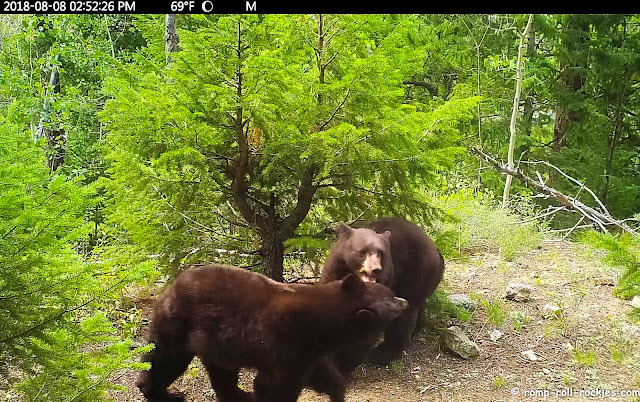 Mating season should be over but a pair of bears were together recently." Then, the video showed some posturing as the smaller bear appeared to be trying to block the bigger bear's way as he walked onward. The bigger bear rotated his head away from the smaller one in a way that reminded me of our dogs when they are about to play. Then, the pair walked out of view of this camera. Fortunately, they stayed on the normal bear route and another trail camera picked them up further down the trail. The smaller bear arrived first. Then, when the bigger bear arrived, the two stood on their hind paws and were clearly playing. 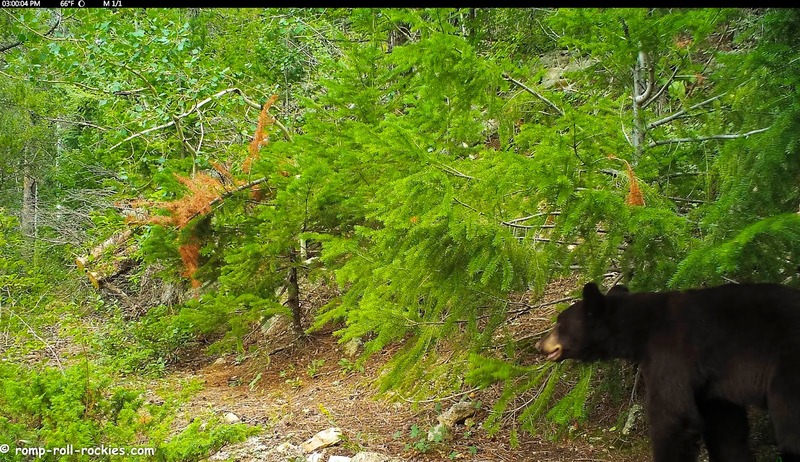 Moreover, I was able to see on the video that they both were male bears! They seemed to play like a pair of buddies. The bigger bear rapidly took control and wrestled the smaller bear to the ground. This was a case of my first impression being completely wrong. 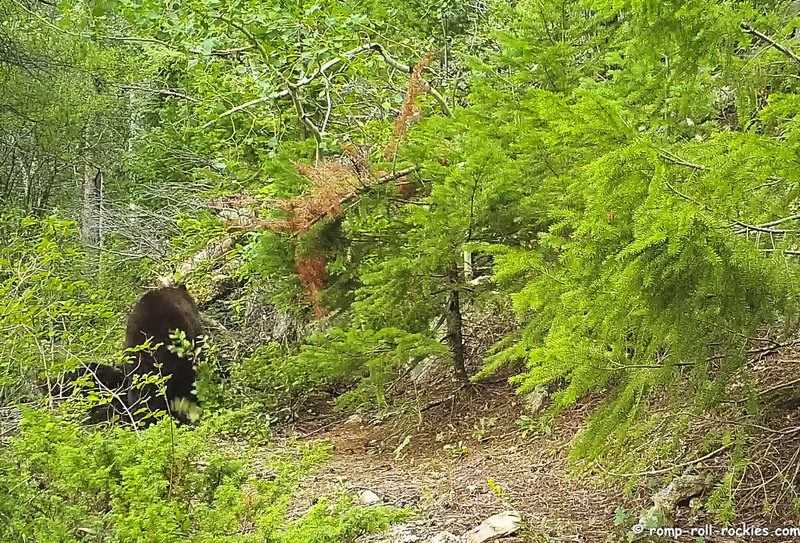 Bear researchers have occasionally observed groups 2 or even 3 male bears hanging out together during the summer, after mating season has ended. However, I'd never seen it until now. I feel very lucky to have captured this footage of bears being social and playful! Hard to believe something so big can be so cute, but the are! I can't believe how well I can hear the trees rustling while they walk and play, just like dogs. LOVE IT!!! I just had my heart melted at baby cows in Africa and a dog sleeping on a donkey in Ireland and now two bears a playin... happiness fills my heart. Love it! As bears have been spotted near us, I am glad to have followed your blog for so long because I am feeling more cautious then fearful. I thank you for that! What extraordinary footage. They are so cute. Isn't it amazing to know that wild animals still play? Brothers from different years? Father and son? or just buddies having fun? This is so wonderful,I had no idea they would play like this. They do look like they're enjoying themselves. Incredible footage. Maybe they're relatives or just feeling safe and secure. Loved this video KB,, they were defiantly having fun! You think they might be brothers? What a fun capture with your cameras!! The Wonder of Watching Bears Swim! Autumn has snuck up on us! A cute bear cub with a unique fur style!